A recent award-winning research paper warns advisors that the financial planning models they are using fail to match retirement reality. 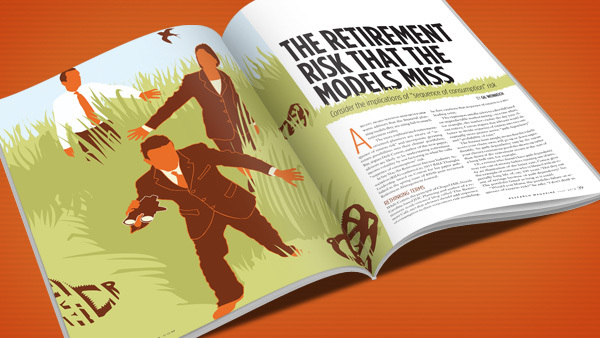 The more sophisticated retirement-oriented planners are aware of “sequence of returns risk” and incorporate gyrating return possibilities into their clients’ portfolios. But, argues Dirk Cotton, author of the new paper, advisors are likely to be understating retirement income volatility by not factoring in what he calls “sequence of consumption” risk. While Cotton, the principal of Chapel Hill, North Carolina-based JDC Planning and author of a retirement wonk-oriented blog called The Retirement Café, says that advisors should add sequence of consumption to their retirement risk modeling, he first cautions that sequence of returns is a misleading term. Or, a retiree who doesn’t have path dependency may run out of money before running out of time. As an illustration of the latter case, Cotton gives the example of someone who is blessed with an especially long life of, say, 105 years. “Did they run out of savings because of path dependency? No. The portfolio lasted as long as it could. That is why sequence of consumption is so important, yet the existing financial models don’t address this reality. The most popular model relied on by financial advisors calls for systematic withdrawals, the most famous expression of which is the controversial “4% rule,” which sets that figure as the safe annual withdrawal rate. Although an advisor might perform an analysis showing that, say, 95% of the time, a client can draw down funds at that rate and not run out of money, “I would suggest and common sense dictates that most people don’t spend like that. That is not a very realistic model,” Cotton says. The retirement researcher—Cotton says he himself has been retired for 10 years and only sees a limited number of clients “for enjoyment”—argues that his research shows clients would obtain better outcomes were they to take a fixed percentage not of their starter portfolio but of their annually recalculated portfolio balance. Not only must advisors plan for sequence of returns risk—or better, path dependency—recognizing that a gyrating market makes portfolio values unpredictable; so too must they plan for sequence of consumption risk. So what’s an advisor to do? Cotton recommends two things: First, get the model right. “You get better planning results if you use a more realistic model.” The model suggested by the 4% rule is “not true,” he says, because it assumes you will be spending a flat amount of money for the rest of your life. But that won’t happen if you go broke 10 years into a 30-year retirement plan; some clients just have to have that Cadillac Escalade and second home, or a loved one is stricken with a medical condition requiring costly treatment.